NOAA’s Ecosystems and Fisheries-Oceanography Coordinated Investigations (EcoFOCI) program is a collaborative research effort by scientists at the Pacific Marine Environmental Lab (PMEL) and Alaska Fisheries Science Center (AFSC) focusing on the unique and economically important high-latitude ecosystems of Alaska. EcoFOCI has physical and chemical oceanographers, atmospheric scientists, and fisheries biologists employed by NOAA and The University of Washington Joint Institute for the Study of Atmosphere and Ocean (JISAO). NOAA established the program in 1984 to study the factors that cause variability in the recruitment success of commercially valuable fin and shellfish in Alaskan waters. Walleye pollock (Theragra chalcogramma) from the western Gulf of Alaska was the first fish species examined in these studies. Since the inception of the program, the scope has evolved to encompass study of the ecosystems of the Gulf of Alaska, eastern Bering Sea, and US Arctic with the goals of improving understanding of ecosystem dynamics and applying that understanding to the management of marine resources. A large component of the EcoFOCI program is biophysical moorings. 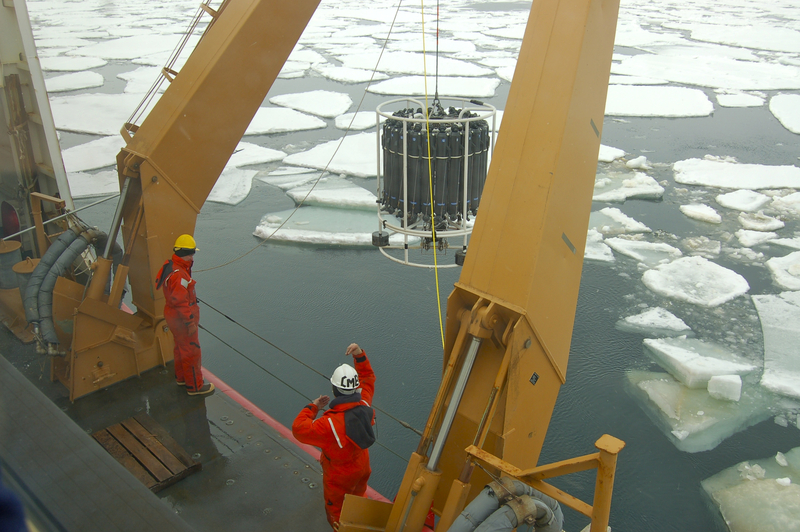 Long-term biophysical moorings collect year-round measurements helping to fill the gaps left by ship-based observations. These measurements provide a foundation for understanding the mechanisms that drive the productive region. EcoFOCI maintains an array of four moorings on the southeastern Bering Sea Shelf (M2, M4, M5, M8). M2 began the 21st year of observation in 2015. Read more about the EcoFOCI program and download all available data here.